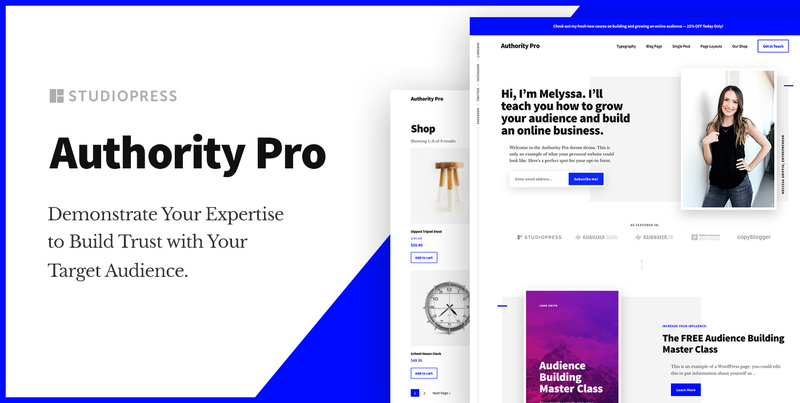 Authority Pro is a fresh new design by our Lead Designer Rafal Tomal and the team at StudioPress. The big idea behind this specific design is to help you put the full extent of your expertise on display. Consistently demonstrating your likable expertise over time is what allows you to build meaningful and lasting trust with the audience members you’re interested in reaching. But only when clear indications of your authority are displayed clearly and intuitively on your website. Because if they’re lacking, a visitor may click away and be gone — never giving you the chance they didn’t know you deserved. It’s your loss and theirs. And it shouldn’t happen. You need a web design that accentuates the most important elements of your expertise, while delivering on your value proposition in the first few seconds of the visit. Do that, and you’ll get your chance. Authority Pro perfectly highlights your knowledge, years of experience, and acquired wisdom. Even if it’s early in your journey toward building expertise and trust, this carefully constructed design will accelerate how quickly your audience grows. It has a built-in area for your lead capture form to make building your list a simple, integrated part of your website experience. It has an optional hero image section you can deploy if you have a compelling image that will help you capture and keep attention. There is a built-in section for recent content — including your latest blog posts and podcast episodes — so your audience can stay up-to-date with your latest content. Have a product you want to promote? Authority Pro makes that easy and seamless to integrate. If you have a special message you want every visitor to see, the call-to-action message strip at the top of the page gives you a clear, conspicuous way to do so. The Authority Pro theme also comes with two PSD files that you can use to easily create stylish ebook covers that fit the overall look and feel of the theme — just like the ones in the demo. Are you ready to put your expertise on display and develop ironclad trust with your audience? Then you need to build Authority. There’s no better way to do that on WordPress than with Authority Pro by StudioPress. Looks awesome! Will it be available for Rainmaker customers? Nice. The bit that caught my eye in this post was the built-in area for the lead-capture form. I can’t find many other online reviews of Authority Pro though. Being a WordPress Theme Developer, I always seek for the motivation and having such design on the market can spark many eyes. I like the elegant spacing and the thumbnails used. It’s always good to see a new theme coming. Such a beautiful design! Authority Pro is by far one of the best themes I’ve seen for WordPress and it’s so damn fast. Keep up the good work! I just got into blogging again and wanted a new theme to revive my dead blog. And the best one which was suggested to me by friends was Authority Pro. Just wanted to see the demo and read the details. And, I must say I am really impressed by this. This is super beautiful. Planning to redesign my personal blog. This is exactly what I will use.